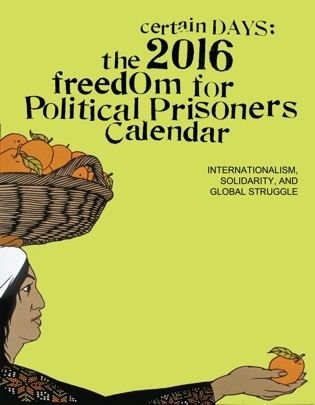 The Certain Days: Freedom for Political Prisoners Calendar collective (www.certaindays.org) is releasing its 16th calendar in the Fall of 2016. Over the years, we’ve turned our attention to various themes: grassroots organizing, resisting repression, and visions of justice. The theme for 2017 is focused on what it takes to sustain our movements. We are looking for 12 works of art and 12 short articles to feature in the calendar, which hangs in more than 2,000 homes, workplaces, prison cells, and community spaces around the world. We encourage contributors to submit both new and existing work. Social justice movements face formidable challenges, from state repression to internal conflict to organizer burnout. Yet there are movements that manage to thrive and grow over time, welcoming new participants and contributing to ongoing struggles. What do these sustained movements have in common? What does it take to keep on keepin’ on, over many years and hurdles? What groups can we look to and learn from as we try to find ways to strengthen our work? What lessons can we draw from liberation movement history? How can we envision our work spanning several generations? Artists – is there a visual way to represent sustained struggles over time? What visual images from movement history prompt us to engage with these questions? (Both new and archival works are welcome). We welcome both artwork and articles that explore this theme. We encourage submissions from prisoners – please forward to any prison-based artists and writers. 1. 500-600 words max. If you submit a longer piece, we will have to edit for length. 2. Please include a suggested title. pieces may be printed with a border, so it need not fit those dimensions exactly. 1. Send your submissions by May 15, 2016 to info@certaindays.org. 2. ARTISTS: Please send images smaller than 10 MB. You can send a low-res file as a submission, but if your piece is chosen, we will need a high-res version of it to print (at least 300 dpi preferably 600). Chosen artists and authors will receive a free copy of the calendar and promotional postcards. Because the calendar is a fundraiser, we cannot offer money to contributors. The Certain Days: Freedom for Political Prisoners Calendar is a joint fundraising and educational project between outside organizers in Montreal, Toronto, and New York, in partnership with three political prisoners being held in maximum-security prisons in New York State: David Gilbert, Robert Seth Hayes and Herman Bell. We are committed to doing work grounded in an anti-imperialist and anti-racist perspective. We work in solidarity with anti-colonial struggles, Political Prisoners and the rights of undocumented citizens and migrants. We are queer- and trans- liberationist. We raise awareness of Political Prisoners and Prisoners of War in the United States and abroad, many of whom are now in their fourth decade of imprisonment. People on the streets should understand the history of today’s social justice movements and how that history is linked to solidarity for PPs/POWs. In addition to building that historical awareness, we emphasize the ongoing involvement and continued commitment of PPs/POWs in these same movements.